The following chronology is compiled from various blog and facebook posts. 1. Somewherein blog by Tokon Thakur on who are the corporate sponsors of Hay, why this English matbori, anointment of elites. He singles out “Kaziputro” (son of Kazi, a reference to author K. Anis Ahmed) and “Anamkonya” (daughter of Anam, a reference to Tahmima Anam). Kazi & Kazi Tea and Daily Star are two of the sponsors of Hay. K. Anis released Goodnight Mr Kissinger, right before Hay, and Tahmima Anam released The Good Muslim earlier this year. 2. Facebook post by Mahbub Morshed on how English language writing is an elite form and Hay is elite attempt to control culture. After Hay ends he posts a revised version on banglanews. 3. Revival of last year’s controversy about excluding Bangla language writing in Hay, elite nature of event, etc. 4. Hay organizers list panels that include Bengali language writers. Critics argue that the Bengali language writers (Syed Shamsul Haque, Anisul Hoque, etc) are all aligned with sponsor Prothom Alo. 5. There is a debate about why Bangla Academy was allowing English language, Corporate power, etc. on exclusively Bangla ground. [By the way BA has been having corporate sponsors for events for years] There are complaints against the current Bangla Academy DG, allegedly led by a former contender for same job. 6. 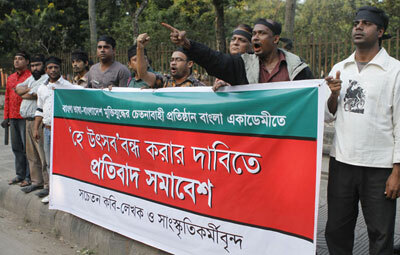 The controversy enters print media, after a manob bondhon outside Bangla Academy, demanding to close down festival. 7. There are other percolating issues such as Niaz Zaman’s acid, and vaguely homophobic, review of Hay-invited Philip Hensher’s 1971 novel. NA Facebook thread asks why Urdu language writers were invited to Bangla Academy. (there are multiple versions of the Hay catalogue floating around on cyberspace. I could not find Urdu writers in the version on FB). 8. New controversy over CHITTAGONG being in Hindi and screened at Bangla Academy. “Hindi colonialism” being a sensitive topic, more so in context of Bangla Academy. The screening is abruptly cancelled, Bedabrata Pain very upset. 9. A post from Reza Ghatak lists 6 allegations. They all seem a bit OTT to me. The factors are multilayered and deeper– Bangladesh’s complicated, changing and contradictory relationship with English, Urdu, Hindi, Western Institutions, etc. Bangla Academy’s changing relationship with corporate sponsorship. The linkage with the two most politically powerful media houses, seen as allied with specific political currents, probably aggravated matters. The debate about authenticity of Bangla Academy reminds, in some ways (though obviously not the same scale), of the Musee Guimet controversy. Actually, the debate is not about ‘purity’ of Bangla Academy and the issue is not a new one. The same question was raised earlier when Bangla academy decided to take corporate sponsors in yearly February book fair. Bangla Academy is an autonomous body, and it runs by public funding. To ensure the independence and free activity of the academy the public funding is needed and it must continue. One cannot see an example that the L’Académie Française or Swedish Academy organized an event with the assistance of corporate sponsor. But Bangla Academy did it, and for this reason, academy is losing its dignity and freedom. I think Academy has the ability to host a so called ‘international’ literary festival independently. Now, what is the status of Bangla Academy in case of organizing the Hay festival? Hay is mainly hosted by a newspaper, the daily star and Academy is one of the co-host/sponsor. We all want to know, what is hay Festival? For what reason Bangla Academy would co-host Hay? It’s okay if British Council or Daily Star organizes such events. Even, corporate newspapers or organizations must think whether an edition of British hay Festival could be hosted or they should choose another way to attract attention from abroad. For instance, we can name Jaipur Literary festival, Kovalam Literary festival, Mumbai Literature Festival hosted in India. A festival of Bangladeshi gestures will be more acceptable. The issue is not whether it’s presenting Bangla literature or English. I think, what writers in Dhaka are trying to say on hay festival is going to be misinterpreted and misunderstood and `Alal o dulal’ is doing the same. It is well known in Dhaka that Prothom-Alo and Daily Star always backs a literary sub-sector, along with some reputed writers which contains lots of minor writers also. That entire literary group was introduced at the events of Hay. So, some may feel annoyed and express that. Along with that, I think, it’s true that, the organizers have a target to promote literature of some selected writers, who write in English and are related with the sponsors/hosts. Daily Star wrote today, “Some 100 eminent Bangladeshi and 30 international writers will be engaged in 30 panels to exchange ideas and share their works and journey to the world of literature.” Now let’s discuss, what’s an International writer? We know, writers from India, Pakistan and UK are participating in the festival. Are all foreign writers international? And the Bangladeshi writers are native/ethnic? This is one but not the only example. From many things in this event make me realize that it’s a new initiative in Bangladesh to promote old colonial things. This is not useful for our literature. These are good points, but your original FB post also claimed (and very strongly) that only an elite (“boroloker chelepele”) writes and appreciates English. I disagree with this class analysis, reality is changing very rapidly. an example of what, exactly? please elucidate. So, a lot of hoo-ha about Hay. Frankly speaking, I can’t pretend that I have a lot of time for the Festival or its backers, who are all heavily representative of the bubble people. Every once in a while, they discover that there’s a Dhaka City, a Bangladesh, that exists outside the Gulshan-Banani-Baridhara area – this time they’ve found out that there’s even something called a Bangla Academy. I can bet you a litre of blood that none of them has any meaningful engagement with the mainstream culture at any level all through the rest of the year – but hey, it’s Hay time, so now it’s all different. Now suddenly, there is this desperate yearning for acceptance by the other side. Why? The bubble people have no need for the Bengali-speakers/writers/readers at any other time. Taile ekhon keno eto dorkar porlo for approval/acceptance? When has there ever been a dialogue among the two sides? How many of the bubblers even know how to read and write in Bangla correctly? Why does a Hay poster have “kobial” and “lekhok” in Roman script? Is the Bengali language so impoverished that it doesn’t have its own script any more, or is it that the Bengali script has been forgotten by those involved so that now we need to write out Bengali words in the English language, because that’s probably how most bubble children would deal with the problem of having to write Bengali in the first place? You have to remember that the “other side”, the mainstream is extraordinarily possessive and proud (and rightly so) about the linguistic and literary aspect of the cultural heritage. So something like “lekhok” and “kobial” is rightly seen as patronizing and offensive, although I doubt the bubble people have the sensitivity to perceive that. You can dismiss it as chauvinism, but the flipside of accepting all this hybridization is ending up with Kolkata-style Bangla which, opinions on this may vary, but I think is a definite loss not just from a cultural pride point of view, but also from the basic point of view of linguistic diversity. Why DOES every language in the world have to converge towards English anyway? Anyway, to come back to the point, the time to reach out and build bridges with the mainstream was five years ago. Not now, all of a sudden that Hay’s back in town. Going forward, Hay needs to be more modest, more welcoming, more inclusive, more genuinely respectful towards the mainstream for the next few years and only then might there be a reduction in the level of ill feeling that’s become apparent. No amount of p|mping by the Daily Star is going to right this ship otherwise. Look at the image from the Hay homepage. Look what they’ve done to the Bangla. Any wonder people are offended? This link takes you to the programme for the Festival. For an event that purports to celebrate the country and the culture and that is being held under the aegis of the Bangla Academy, the NUMEROUS mistakes in the very limited Bengali material herein is nothing short of offensive and tells you all that you need to know about the agenda and the fake Bengali connections of the Festival organizers. Truly shameful. question to hay visitor: is there any particular reason you have chosen anonymity to make your points? you are not writing anything that would typically require anonymity (e.g. criticism of the army or the government that could make life difficult for you), so why the smokescreen? and before you counter, logicat is my on-line handle, but i am known to the alal o dulal community, so my comments are not anonymous. my name is zafar and i am a journalist in dhaka. Logicat, people can choose to use anonymity for any reason whatsoever, or for no reason. I don’t think this is something that needs to be explained or accounted for. Let me make some observations. Very personal feelings about the Hay festival. Please do not see sarcasm in my comments. First of all, not being exposed to UK life style, esp literature and arts scene, I did not know what Hay festival is. First I thought, it might be something like an English medium version of নবান্ন উত্সব type festival. I thought somehow Hay relates to newly harvested crops. So I had to Google hay festival to understand what hay festival really meant. Second, as a city, Dhaka is becoming unlivable very rapidly. There is hardly any exclusive outlet for middle class families to spend an evening outdoors. 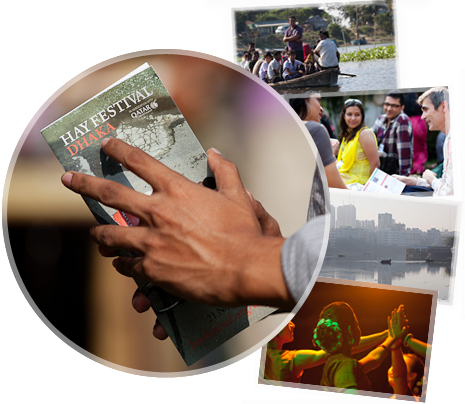 An event like Hay Festival is very much needed for Middle/ upper middle class Dhakaites to take the family to. Movie theaters are for either “aaam publics” or ” couples from universities and colleges”. Even Boshundhara cineplex has become an alien zone for families. Ekushey Boi Mela which started as a cultural event exclusively for savvy urban educated class, has over the last decade, become an ” aam public” event. Starting from your Kajer Bua to your local motor mechanic to your driver’s sister in law– all are rushing to the boimela these days. So, I see Hay festival is an event where you are unlikely to bump into your driver’s sister in law. It is a cultural re-incernation of boimela of 1980s. In 80’s, boimela was an exclusive literally elite event. We have an increasing proportion of English medium educated kids. In addition to Bangla literature, they are being exposed to English language literature. While Ekushey Boimela does not cater to English literature, I feel annual hay festival will cater to a significant portion of Dhaka citizens who are connoisseur of English literature. . I think, the Hay Festival is a very professionally done event. Look at their website. It is awesome. The programs are very conveniently scheduled. Bangla Academy, Chhayanot etc have a lot to learn from Hay festival. If they learn, our Ekushey festivities and Pohela Boishakh festivities will be much better managed and much more enjoyable. 1. It was a professionally done event, barring the PR fiasco of pulling out ‘Chittagong’ the day before the event started and after having it publicized in the programmes/schedules. Event organisers in Bangladesh have a lot to learn about professionalism from these mostly young people, whether or not they can speak/write in Bangla properly. 2. There is much hunger for other cultures/languages even among the “aam public”, judging by the wide-spread participation of a cross-section of people in the festival this time, although the proportion of the elite may still be high. Credit for this goes to the organisers for choosing Bangla Academy as the venue this year. 3. Unfortunately for you Rumi (and there is no sarcasm in it if there was none in yours), such events too would be taken over by “aam publics” eventually, so it would be futile to resist it. 4. Perhaps they could have even pulled off screening ‘Chittagong’ in the closing ceremony, in spite of the protests, if they felt they had more mainstream support. Here I agree with the anonymous Hay Visitor’s comment that the strategy to prevent future potential ‘ill feelings’ would be to get it more mainstreamed. It will become mainstream just as literary festivals became mainstream in India. It will probably happen even faster than India, because of huge unmet demand for events and places to go. I agree with Naeem. Only a matter of time. And all the talk of elitism, favouritism, corporate hegemony, etc., will be in the past. The elites everywhere are an endangered species. It is good that we have at least one or two people championing their cause. If anything, when English language writing becomes more popular you’ll have some people romanticizing the days when it was a smaller, “more intimate” group. But then again, 15-20 years from now, it might no longer be english, but chinese, the way things are going……. Had this not been the Hay Festival, but, say, the Padma Festival (Utsab / Utshob?) with a similar cast of guests and attendees, would it have been more palatable? Is this really a battle of nationalism (parochialism) vs globalism, commercial interests vs grassroots, or actually about who gets to set the agenda? epistemic battle of Bangla cultural nationalism and white liberal british import, with hurtness on the side. Its been happening to ages don’t you know. Logicat, Zafar, Mr Bojangles, whoever you are.. what on earth can it possibly matter what my name is? Talk about non sequiturs. Either you can respond to my substantive charges, OR you can go have an overpriced coffee at Kozmo with the rest of your clueless, privileged tribe. Your choice. PS Since you’re so interested in personal details, how’s the state of your Bangla? Do you perchance read it and write it fluently? Or is English your only comfortable tongue? The sheer disconnection and goddamned hubris of the bubble people never ceases to amaze. you see, that’s the problem. you are free to make snide comments about me and anyone else you wish to malign without fear of having to suffer anything in return. maybe if i knew something about you, i could make similarly snide and nasty comments about you. that you would accuse anyone else of hubris is laughable. your post drips self-satisfaction and superiority, merited or not, i can’t say, since i don’t know who you are. i’m sorry, but the kind of blanket contempt and meanness of spirit that permeates your post just comes across as really ugly. if you want to unleash bile and vitriol and name-calling and prejudice (to say nothing about gross, grotesque, and offensive generalizations), then have the decency to sign your name. anonymous attacks are just cowardly. oh, and one final point: fluency in bangla is not a yardstick of one’s moral superiority or commitment to the country. i know people who have devoted their lives to this country but cannot speak bangla well. so what? off with their heads? Hay Visitor, while I find myself in agreement with almost everything you say, including your defence of anonymity, it is very. very difficult to take your side when you try to score cheap points about the state of Zafar’s Bangla. Who cares what he speaks and how he speaks it? That’s the sort of snobbery that Bangla academy and those who run it like to promote – yet another reason why the protesters against the “exclusive” Hay festival leave me a bit cold. DS, I only bring it up cos he gives such a damn about my identity. That is about as relevant to this discussion as his Bangla. Is coffee really that good at Kozmo ? Why is Alalodulal in English? There are occasional Bangla and Bilingual posts as well on AoD, but our primary focus is English language essays about Bangladesh– a space not addressed by other blogs.